Last week, I turned 24. I’ve decided that by my 25th birthday, I want to reach a pretty major life goal. I want to be a digital nomad. Okay, the way I just phrased that makes it sound like I’m throwing caution to the wind. 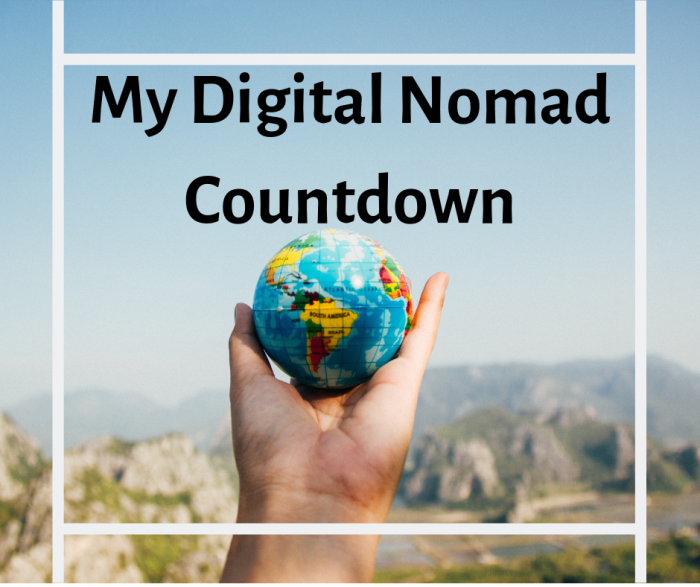 I’ve actually wanted to become a digital nomad for over a year, I’m just giving myself a deadline now. After a year and a half of building my freelance writing business, I feel like I’m ready to take the next step. A digital nomad is someone who moves around while doing work they can complete anywhere with an internet connection. Digital nomads might work freelance or have full-time remote jobs, but the main point is that their work doesn’t mean they have to stay in any particular place. Digital nomads travel the world while they work- some people jump between favourite parts of the world; others move somewhere new every few weeks. Digital nomadism has become incredibly popular in the last few years, as people figure out how to balance work and travel. Digital nomads tend to work in co-working spaces, coffee shops, or anywhere with WiFi. It’s a worldwide movement and gives people the chance to see the world without having to take time away from work. I could write a long, emotional paragraph here, but bullet points are more fun. I love to travel! The world is amazing and I haven’t seen nearly enough of it. I already work from my laptop- might as well do it from interesting places. I really think travelling and new experiences will make me a better person and writer. Who doesn’t love a bit of adventure? What are the odds this will happen? Get my business to a place where I’m financially stable enough to move around. Have enough savings that I’m ready for mistakes, disasters, and anything else travelling could throw at me. It’s a short list, but a tough one. Can I do it? That’s to be determined over the next year. I’m not going to book a plane ticket for my 25th birthday and get on it no matter what happens. My plan isn’t to start travelling on that day, just to be in a position where I could. There are so many factors here that could put off my plans for a week, month, or even a year. The main focus here is that when I do start travelling, I’m ready for it. Right now, I have a couple of resources that are helping me plan the next year. My business. I’ve been working as a freelance writer for a year and a half, and have steadily been building up a client base so I have regular work coming in. If I keep building up my business, I should be able to run it from anywhere in the world. The Freelance Travel Network. I have a huge amount to learn when it comes to running a freelance business, so I enrolled in the Freelance Travel Network program. Danielle Thompson is an amazing teacher and I’m learning a lot. My progress is making me very hopeful about achieving my goals. Female Digital Nomads. This Facebook group of women working all over the world provides a great community. They share jobs, information, and support with each other. When I need to figure out the logistics of travel, I’ll have a lot of resources from them. I feel a little apprehensive as I write this. This will be a tough goal to achieve, and this blog post is a pretty public declaration. Wherever I am in a year’s time, it’ll be interesting to look back at this post and see how far I’ve come. Whether or not I’ll be reading it from a beach on the other side of the world remains to be seen. Wish me luck!